To some, the idea of Dayton being a heavy favorite to win this league isn’t a huge surprise. To others the confidence in which I say they should be — as a VCU grad, no less — may seem shocking. But when you dig into the numbers, you really get the sense that Pittsburgh, PA — a four-hour drive from Dayton, OH — should become the location of the end of Dayton’s 14-year Atlantic 10 tournament championship drought. UD perhaps didn’t make as “lowd” of a non-conference statement as Flyer fans would prefer, but considering the injuries, a 9-3 start to their season should suffice as a decent enough opening act. Archie Miller’s team has battled injuries since essentially he was hired and have fought through them once again this season. Two of the Flyers three losses — losses to Saint Mary’s and Nebraska by a combined six points — came without the help of senior forward Kendall Pollard or redshirt sophomore transfer, Josh Cunningham. While Cunningham is not likely to return this season, Pollard is back and has helped UD to a 5-1 record with him on the floor, the only loss coming in Chicago to a good Northwestern by three points. The Flyers are now forced to deal with A-10 Player of the Year candidate Charles Cooke’s wrist injury. Cooke missed UD’s blowout home win over VMI but could expect him back in the lineup when Dayton hosts what I think is a bit of an underrated La Salle team to open conference play. His status is day-to-day. But considering all the injuries to start the season, you must love Dayton’s chances toward the end of it. The Flyers have played one of the tougher Atlantic 10 schedules and have posted some of the most promising numbers in the face of adversity. 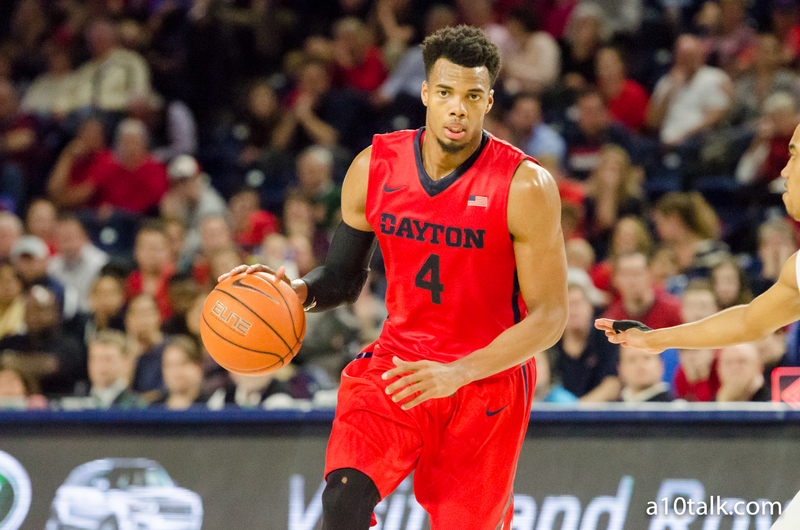 Dayton owns the A-10’s top-rated defensive according to Pomery, ranking 32nd nationally. The Flyers are top-100 defensively in effective field goal percentage, turnover percentage, blocks percentage, steals percentage and basically every stat you want to be top-100 in. They defend. Offensively they haven’t been quite as impressive yet still currently rank within the Kenpom top-60 thanks to an effective field goal percentage of 54%, the 48th best in the country. Dayton doesn’t turn the ball over, they shoot the three well, shoot the two well and once they start hitting free throws at a higher clip, become even more dangerous. In short, Dayton is the league’s most balanced team and have been just that despite injuries to key players. What could help the Flyers quest to achieve Console Energy Arena glory as well is a very limited number of legit challengers. While several bottom-of-the-league teams look improved (UMass, Mason, La Salle), the top of this year’s Atlantic 10 appears far less dangerous than in year’s past. Only two A-10 teams, Dayton (No.40) and Rhode Island (No.45) currently ranked within the top-50 of Pomeroy’s rankings. Last season’s Atlantic 10 finished with two top-50 kenpom squads, both of which (VCU and Saint Joseph’s) appeared in the 2016 Atlantic 10 tournament championship game. The Flyers advanced to the tournament championship the previous year as the No.42 nationally ranked team according to kenpom before falling to No.30 VCU who knocked off No.37 Davidson en route to taking the title. This year’s challengers likely come in the form of Rhode Island, VCU and Davidson. The Rhody Rams have dealt with injury issues themselves and will be without star center Hassan Martin indefinitely. Both VCU and Davidson have top-100 offenses and defenses but currently find themselves outside of the top-50 looking in overall and haven’t flashed the balance of UD. VCU is off to a solid start but has a very turnover-prone offense. The Rams don’t crash the offensive glass and have at times, gone ice cold offensively thanks to a team that relies heavily on attacking the basket for points. Davidson appears to be a much more balanced team than last year’s squad that struggled to defend. The Cats have however have struggled to hit from deep, ranking 214th nationally in three-point shooting and have still looked questionable defensively against quality competition, allowing 85.8 points per game against kenpom top-100 teams. Kendall Pollard, Scoochie Smith, Kyle Davis and Charles Cooke are arguably the A-10’s best senior class and have seen great success in their time at Dayton. The cherry on top could, and very well should come in the form of a 2017 Atlantic 10 tournament championship.